Deb Haaland: "Why not me? Why not now?" In perhaps the most historic milestone of the 2018 mid-term elections, the United States Congress will soon welcome its first two Native American women members. Deb Haaland (R) and Sharice Davids . 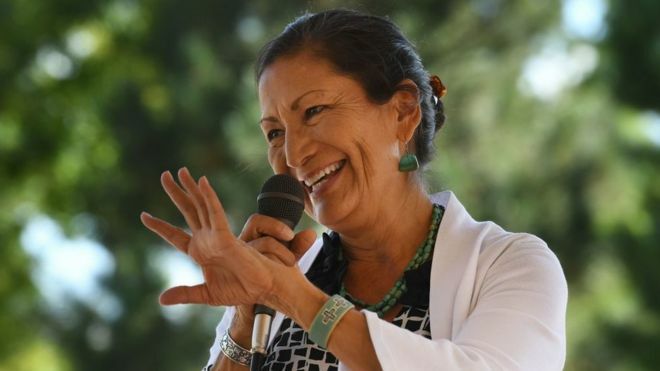 Deb Haaland, the former New Mexico Democratic Party Chair and a member of the Pueblo of Laguna, will replace Democratic Rep. Michelle Lujan Grisham, who won her race for Governor. Haaland defeated Republican candidate Janice Arnold-Jones. And in Kansas, attorney Sharice Davids, a member of the Ho-Chunk Nation, unseated GOP Rep. Kevin Yoder. The historic impact of their victories can’t be overstated, says Mark Trahant, editor of the Indian Country Today newspaper. Of the roughly 12,000 people elected to the United States Congress since 1789, only 300 have been of Native American descent—and none of that group were women. Deb Haaland poses for a portrait on Route 66 in Albuquerque's Nob Hill neighborhood, where her campaign office is headquartered. Haaland is one of roughly 65 Native American women running for public office in 2018. She is one of the first Native American women to serve in Congress. Deb drafts a memo in her campaign headquarters in Nob Hill, Albuquerque. Deb and a team of volunteers make calls to potential donors from her campaign office in Nob Hill. She prides herself on not having accepted any contributions from corporate PACs, instead choosing to focus on grassroots fundraising. Deb attends an event to commemorate Memorial Day in Albuquerque. Both of Deb's parents were military veterans, and her father is buried at Arlington National Cemetery. Deb calls her mom to check in at the end of a long day of campaign events. Deb hugs a supporter at an event to commemorate Memorial Day in Albuquerque. Native Americans serve in the U.S. Armed Forces at a higher rate than any other ethnic group. Deb has dinner with campaign volunteers and supporters in Albuquerque's Nob Hill neighborhood, pausing periodically to greet supporters as they filter through the restaurant. “Indian country will see how important it is to have full representation, to show that Americans need to include the first Americans as part of the national discourse,” Trahant says. Their victories are the centerpiece for an equally historic election season for women overall. Ninety-six female candidates won House races, with 31 women newly-elected and 65 incumbents. And in Michigan and Minnesota, the first Muslim women were elected to Congress as Michigan Democrat Rashida Tlaib will fill the seat vacated by Representative John Conyers. Ilhan Omar of the Minnesota Democratic-Farmer-Labor Party replaces Representative Keith Ellison, who won his race for Attorney General. The dramatic election results come at the apex of America's reckoning with issues of sexual harassment and the power dynamics that have stifled women's voices throughout history. From the #MeToo Movement to the contentious confirmation hearings of Supreme Court Justice Brett Kavanaugh, the fractious response fueled the rise of women in the political sphere. The wins for Haaland and Davids also highlight the long road to full participation and representation for Native Americans in politics. The United States government only granted citizenship to all Native Americans in 1924; Haaland’s home state of New Mexico was the last state to grant them the right to vote in 1962. Many observers credit the Dakota Access Pipeline protests that began in 2016 for igniting a flurry of Native American political activism. “Standing Rock was one of those moments that whether or not they were successful in blocking the pipeline, that idea that you can use this new-found authority to do things was something that I think was infectious,” Trahant says. It’s estimated that several dozen candidates ran during the 2018 mid-term season, vying to join the only two Native Americans currently in Congress—Tom Cole, a Chickasaw, and Markwayne Mullin, a Cherokee. Both are Republicans from Oklahoma. Haaland and Davids come from career military families, part of the trend of deeply entrenched service by Native Americans. They have fought in every war the United States has been in, and enlisted in disproportionately high numbers. Davids is the daughter of a single mother Army veteran, and Haaland’s (non-Indian) father was a marine who won a Silver Star and is buried in Arlington. She lays claim to being a 35th generation New Mexican, and credits both her mother and grandmother with passing on their indomitable spirit. Native Americans have faced the same challenges of voter suppression strategies like poll taxes and literacy tests that African Americans are still enduring to this day. For example, in October the Spirit Lake Tribe in North Dakota filed a complaint about a voter identification law the tribe said disenfranchised voters living on reservations. But observers like Trahant believe the presence of Haaland and Davids on Capitol Hill will make an indelible imprint on the Native American consciousness. “For the first time, a young girl living at Laguna Pueblo could say, ‘I could grow up to be President.’ That has not been possible because they never saw anybody that looked like them. And I think that is more important than any single election.”/.